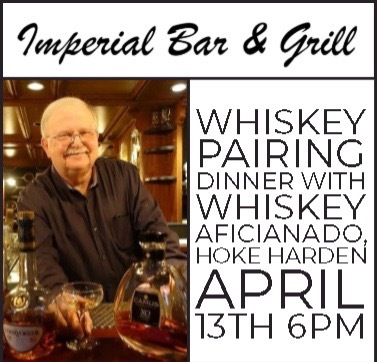 Imperial Bar & Grill Whiskey Pairing Dinner - Visit Maupin, Oregon. A 5-course dinner plus a nightcap of a very rare whiskey. 6 special and different whiskeys will be featured at this dinner. Whiskey aficionado, Hoke, will be there to explain everything from the flavors to the distilling process as well as other similar whiskeys you can find on the market to compliment your own library at home. For dessert: a Hazelnut encrusted Brownie paired with a taste of Whistle Pig 10-year Rye. visit Imperial Bar and Grill for more information and to purchase tickets.